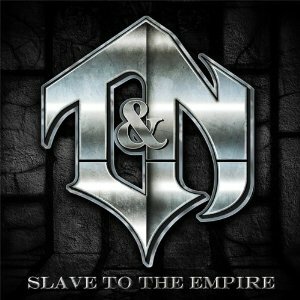 Hall of the Mountain King: Review: T&N, "Slave to the Empire"
To fill out the album, the band invited a few guest vocalists – Sebastian Bach (Skid Row), Tim Owens (Judas Priest, Iced Earth), Dug Pinnick (King’s X) and Robert Mason (Warrant) – to re-record some Dokken hits. The “covers” are quite interesting. Bach and Owens, as expected, knock their performances out of the park on songs that seem tailor-made for them. Bach hits the high smooth tones of ballad “Alone Again” with a style that’s sure to make Don Dokken secretly a little jealous, and Owens turns “Kiss of Death” – one of my favorite Dokken songs – into a much meaner, angrier song. I was a bit unsure of how Pinnick would handle “Tooth and Nail,” as his vocal style doesn’t seem to fit, but it’s actually quite a good piece for him. His vocal brings a very different feel to the song, despite the fact that the band plays it pretty straight musically. The gang vocals get a little more oomph, and it’s just a tougher version. Mason takes his turn on “It’s Not Love” and delivers a better performance than any from the most recent Warrant record. There’s a real classic-rock feel to the vocal. The final cover is a fairly straight treatment of “Into the Fire” with Pilson on vocals. It’s not bad, but doesn’t really bring a different dimension from the original. That, of course, brings us to the seven original tunes. Not being a huge fan of Dokken back in the day, I wasn’t expecting much. My initial interest in the record were the versions of proven tunes from their older band. I got quite a surprise with the new stuff, though. Certainly there’s a heavy link to their former work. Many of the songs here wouldn’t be out of place on any Dokken record. But then there are a few surprises. One of my favorite songs on the record is the gritty, blues-rock infused “Jesus Train.” Pilson puts on a smoky, gruffer voice, and there’s a little bit of boogie mixed in. Of course, Lynch gets in his 1980s shred, particularly toward the end, but it brings a different dimension to the record. If there’s a weakness here, it would be Pilson’s vocals. They’re sometimes pretty rough. A good example is the grunting growl on “Mind Control,” an otherwise pretty good hard rocker that just needs a little more power behind the vocals. Pilson’s better when he lets his bass do the talking, as he does on “Sweet Unknown,” laying down a great groove to base the song around. And not all the vocals are a weakness. I particularly like his performance on “When Eagles Die.” He’s got a smooth delivery that’s a little reminiscent of the guy named Dokken on the softer parts of the song, and when the heavy stuff kicks in, he perhaps pushes it a little too hard at times, but it works.